Quinoa has become very popular with cooks today, especially during Passover when this berry, which tastes like a grain, stands in nicely for what we crave. It is high in protein and has other healthful characteristics. 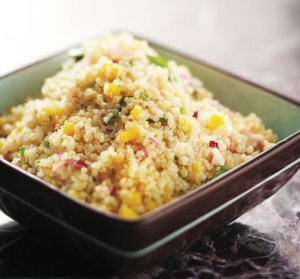 Once the quinoa is drained, place it into a medium pot with the water. Bring to a boil. Reduce the heat and simmer until the water is absorbed, about 10–15 minutes, or until the grains turn translucent and the outer layer pops off. Drain. Meanwhile, in a medium bowl, combine the minced jalapeño, basil, cilantro, red onion, and mango. Drizzle in the oil, salt, and lime juice. Stir to combine. Add the drained quinoa and toss to combine. Season with salt to taste. Serve warm or at room temperature.